Discover how to transform your prayers into change through Anne Graham Lotz's inspiring look at Daniel and his own prayers. Want to discover more of what prayer can do? This isn't your everyday day kind of prayer. It isn't even a special, one-off kind of prayer during powerful moments or times of need. The Daniel Prayer is a deep, urgent commitment to prayers. Fervent and done with everything you have and are, and which never stops until heavens are moved and nations are changed, The Daniel Prayer takes it form from the powerful story of Daniel in the Old Testament. A young man living in a nation in exile, alone and away from where he belongs, needing to move a nation out of captivity, Daniel was under unending pressure to fold. To bow before the culture and Gods of the Babylonians. He prayed in a way that accomplished more than anyone would have ever expected, and that is what Anne Graham Lotz explores for us today. That through a deep, whole-hearted commitment to prayer, to prayer that moves heavens, that doesn't give up in the faces of struggling concentration, wavering faith, needs and troubles. The Daniel Prayer is a way of praying which is filled with power. The kind of power that shows God's glory to the world. The kind of power which changes lives. The kind of power that changes nations. 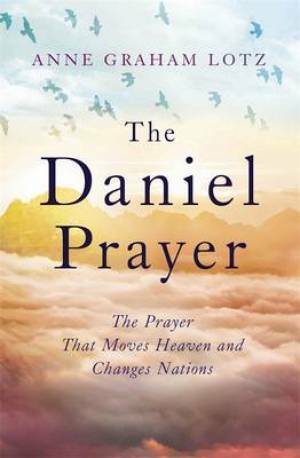 The Daniel Prayer by Anne Graham Lotz was published by Hodder & Stoughton General Division in March 2015 and is our 3763rd best seller. The ISBN for The Daniel Prayer is 9780340908525. Be the first to review The Daniel Prayer! Got a question? No problem! Just click here to ask us about The Daniel Prayer. Many people today find that their prayers don't 'work'. And so like a broken phone or TV remote, they throw prayer out as unnecessary 'clutter' in their busy lives. But Anne Graham Lotz has found that prayer does work, and in this radically inspiring book she turns to the prophet Daniel for help. And most crucial of all - what difference does my prayer actually make?